Habit: Perennial herb to shrub, rhizomed or not. Stem: leafy or scapose. Leaf: 2--15, basal or cauline, cauline clasping or sheathing, petioled [or reduced to scales, with short branches flattened, green, appearing leaf-like]. Inflorescence: terminal or axillary, panicle or raceme. Flower: unisexual or bisexual, generally white (+- pink); perianth parts 4 or 6, fused or not, erect, nodding or pendent; stamens (4)6, +- fused to perianth, anthers attached near base; ovary superior, chambers 2--3, style 1, stigma +- 3-lobed. Fruit: berry, spheric, red, orange-red, or blue-black, or capsule, papery. Seed: 1--12. Genera In Family: 26 genera, 475 species: northern hemisphere, South Africa, northern Australia; species in several genera cultivated as ornamental, house pls. Note: Smilacina moved to Maianthemum. Stem: thick, woody or +- below ground. Leaf: rosettes 6--20 dm, stiff, sword-like, base much expanded, white, fleshy. Inflorescence: panicle or raceme-like, scapose, bracted, < 4 m. Flower: perianth parts 6 in 2 petal-like whorls, < 6 mm, +- white; stamens 6, filaments slender; pistil reduced in staminate flowers, pistillate flowers with staminodes; ovary superior, 3-chambered, style and 3 stigmas short, ovules 2 per chamber. Fruit: capsule, papery. Seed: 1--3 per fruit, ovoid. Species In Genus: +- 30 species: southern United States, Mexico. Etymology: (P.C. Nolin, French agriculturist, b. 1717) Note: Leaf widths taken just above expanded leaf base. Stem: 3--21 dm, generally aboveground, erect, branches 0--several. Leaf: 65--200 per rosette, 20--40 mm wide, generally green, base 5--16.5 cm wide, margin minute-serrate. Inflorescence: 1.4--3.8 m; scape 26--90 mm diam at base; bracts persistent. Seed: 3--4 mm, red-brown. Chromosomes: n=19,20. 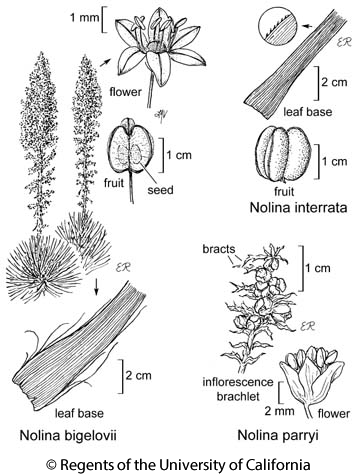 Citation for this treatment: Dale W. McNeal & James C. Dice 2012, Nolina parryi, in Jepson Flora Project (eds.) Jepson eFlora, http://ucjeps.berkeley.edu/eflora/eflora_display.php?tid=34682, accessed on April 26, 2019.
s SNF, s SNH (Kern Plateau), e SnBr, e PR, D. Markers link to CCH specimen records. Yellow markers indicate records that may provide evidence for eFlora range revision or may have georeferencing or identification issues. Purple markers indicate specimens collected from a garden, greenhouse, or other non-wild location.